(SUDBURY): Green Party candidate Dr. David Robinson slammed NDP opponent Suzanne Shawbonquit over her opposition to putting a price on carbon pollution as part of an integrated effort to combat climate change. In two public all-candidates forums last week, NDP candidate Suzanne Shawbonquit stated her opposition to a price on carbon pollution. The NDP by-election campaign has said nothing about the party’s plans to address the climate crisis or how Sudbury could thrive in a low carbon economy. 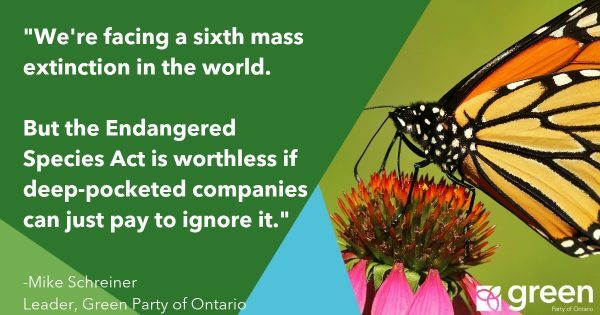 The Green Party of Ontario has a simple, effective climate policy: carbon pollution should be priced with a revenue-neutral fee and dividend plan. Carbon cheques will be sent to all Ontarians from the proceeds of pricing carbon pollution. Dr. David Robinson and the Green Party are on a mission to bring honesty, integrity and Carbon Cheques to Ontario. Congratulations Peter Bevan-Baker and PEI Greens!